When the Spireites lost Norman Bullock to Bury in 1945 they turned to another ex-forward to replace him. A stylish inside-forward and a fine cricketer too, Bob Brocklebank was born in north London in 1908 and came to the attention of Aston Villa’s scouts in 1929 while playing with London amateurs Finchley. Seven years at Villa Park were spent almost exclusively in the reserves before he was transferred to Burnley at the age of 28 in 1936. Bob became a Turf Moor regular, making 121 League appearances and scoring 33 goals for the Clarets. 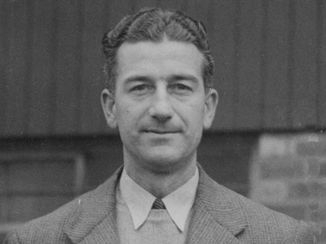 Brocklebank continued to play for Burnley through the second world war but began to put out feelers for a post-playing career in the game. To come to such a well-run club as Chesterfield was a dream start to anyone’s management career and Brocklebank jumped at the chance when it was offered. Players respected his languid, gentlemanly approach to the job and life in general, and responded to it. Although the war was all but over the game had not yet returned to its peacetime format and Bob’s first season could afford to be written off as experimental, without the threat of relegation to worry about. In the event it proved successful. The side stormed to the top of a league that mixed first and second division clubs, beating Blackburn 7-0 and putting eight unopposed goals past Sunderland in two games – five of them at Roker Park! Although the side slipped to finish seventh this was a fine achievement, and this was built on when “normal” football resumed in 1946. The side was showing well until the savage winter of 1946-7 saw the side play just twice in two months, and form collapsed. Despite this, the team finished in fourth place in the old Division Two – this remains the club’s highest finishing position. Supporters may remember Bob’s time as much for the players that were sold as for those he brought in, but Chesterfield were comparatively poorly-supported and were a “selling” club. Whitaker, Linacre and Roberts went for big fees during Brocklebank’s tenure, but the acquisition of Stan Milburn, Norman Kirkman, Tommy Capel and Reg Halton proved that Bob knew what to look for in a player. The need to sell was a frustration to Brocklebank, though, and when Birmingham City approached the club for his services in January 1949 the lure of a bigger club proved irresistible. Curiously, Brocklebank’s post-Chesterfield career seems to be made up of seasons that were either successful, or dismally poor, with no middle ground. Birmingham were relegated in his first season but he is credited with building the side that got back up and reached the final of the 1956 FA Cup. By then, he had left for Hull City: they went down in 1955-6, his first full season in charge, back up in his second and back down again one season later! Bob moved on to Fourth Division Bradford City in 1958; they finished one place off promotion in his first term but were forced to apply for re-election at the end of his second year in charge. The following year the pendulum swung back and City finished fifth again. The City board extended his contract in 1964 but when The Bantams made an indifferent start to the 1964-5 season Brocklebank resigned. He did not seek full-time employment in football again and eventually retired to Brixham, in Devon, where he died in 1981 at the age of 73.